In my career, I have been in the position where I had to create Shariah compliant structures to enable transactions to take place. This has been perhaps the most interesting (and challenging) aspect of my work, for several reasons. First of all, I have always enjoyed solving problems, whether it is a crossword, logic puzzles, trying to play chess and so on. I am very fortunate that I was made responsible for finding solutions to problems and puzzles in banking too. Before specialising in Islamic banking, I had worked in the area of exotic derivatives. This involved creating quite complex transactions from building blocks with a view to delivering a solution to clients. At the same time, I had to understand very well the consequent risk that the bank was taking on (as a result of selling the products) so that these risks could be identified, and then hedged by taking positions in various markets. This provided me with a strong background to support my work in Islamic banking. In public literature, we are often presented with an overview of how Islamic products work. X buys this asset, Y sells this asset, and various cash flows are exchanged, and everyone is happy. I find this a little frustrating personally, because I am aware of the (often complex) underlying work that is involved in creating these transactions. I wish to share some of these aspects with the reader. At the moment, we have a situation where the customer is paying money for shares. However, the customer is looking for financing here, so why is he agreeing to do the opposite and pay cash to another party? The answer is simple enough – this cash flow represents the repayment of the financing by the customer in the future. If this is the case, then the customer is still waiting to receive the loan amount. To achieve this, the customer must now sell the shares that have just been purchased. Another point to consider is this – who exactly is the customer buying the shares from? The answer to this lies in what the desired outcome of the parties is. Given the subsequent cash flow represents the repayment of the financing in the future, the client may well be indifferent if he is to repay the bank, or another party that is selling the shares. However, as far as the bank is concerned, it would prefer to have the legal obligation of repayment to be from the client to the bank directly. This implies the seller of the shares should be the bank itself. In this case, we would have the bank (as seller) selling the shares to the bank (acting on behalf of the customer). This is permissible, and the bank will have obtained permission from the client to act on the client’s behalf to purchase the shares (from itself). The general requirement in this case is that the transaction must be deemed to be at arm’s length, will full documentation to be exchanged as required (for example a sale contract - or an offer and acceptance). Now the customer has the shares, what happens next? The website informs us the customer can now sell the shares (and receive the funds from this sale) or transfer the shares to their investment portfolio. If the client wishes to obtain financing (and remember this is the only reason the customer would have approached the bank in the first place), then the customer must sell the shares. So, now we have two further questions: who does the customer sell the shares to, and for what price? The second question is easier to answer – the price must be the size of the financing agreed by the bank and the customer. This amount is to be paid immediately by the new buyer, and thus the customer now has the cash amount that is required. We will note that the sale price of this second transaction must be lower than the sale price in the first transaction. This is because the second transaction delivers the agreed financing amount and the first transaction delivers the repayments (being the principal plus agreed profit amounts) from the customer to the bank. It is reasonable to assume that the bank would also be acting on behalf of the customer for the second transaction. The reason is that the customer is not expected to be able to arrange the sale of shares on his own – he can reasonably expect the support of the bank (acting on the customer’s behalf) to arrange to sell the shares to a suitable buyer. Well, it appears that we have achieved the desired outcomes for the customer – he is receiving the principal amount immediately, and is delivering the repayments to the bank in the future. However, from a structuring point of view, we are far from finished. Firstly, we have to address the question of who the buyer (in the second transaction) is. It must be a buyer prepared to pay a pre-agreed price for the shares. The buyer will also have to accept this basket of shares as is – the buyer can not refuse to purchase the shares because they think one of the target companies might pose a risk that the share price may go down in the near future. 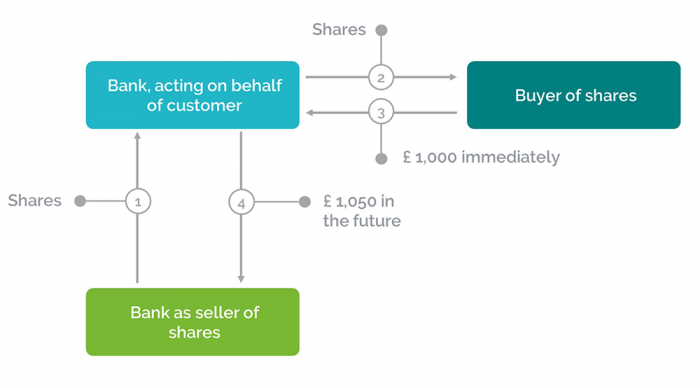 Perhaps the buyer purchases the shares for £1,000 (and pays the customer immediately) and then the share price falls within the next minute. Is this a risk that this buyer can deal with? The final point to make at this stage, is to remember that the bank has agreed to provide financing to the client. But at the moment, we have not seen how the bank delivers the principal of £1,000 to the client. 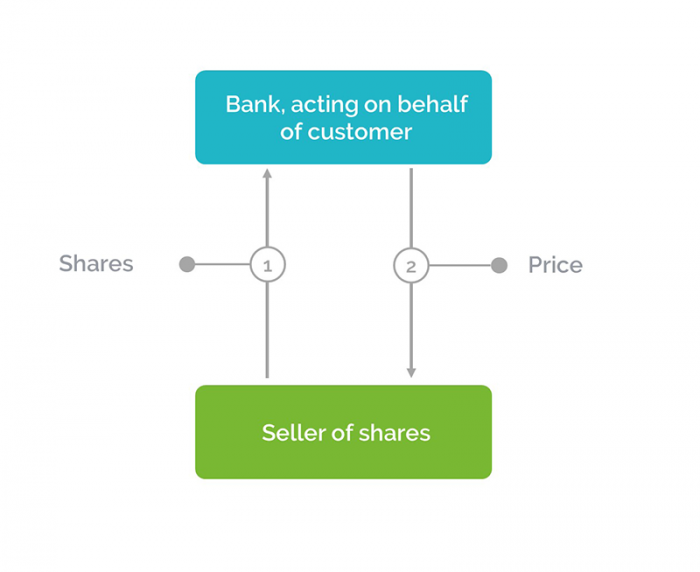 Currently, it is the buyer of the shares that is delivering the principal to the client. Of course, one easy solution is that the bank itself could be the buyer of the shares in this second transaction. That solves all the issues of price risk quite nicely. However, this simple solution may fall foul of other restrictions in Shariah compliance. We shall continue our discussion of this structure in the next article, and look at more than one solution to complete this structure. As we do so, we will highlight further issues and risks that all the parties take on in this Murabaha share financing structure. And the potential solutions to these risks will provide some key insights as to how similar risks are mitigated in other Islamic structures that involve the purchase and sale of assets. Thank you, Hasibullah. I hope things are well with you. Were you a student on my module "Islamic banking in practice"? I recognise your name! Yes Stephen you are correct and thank you for your comment. Transparency at all times is important and in keeping with the principles of equality and fairness. Hi Henry. Feel free to message me directly.